In an attempt to provide awareness concerning preventive measures to help avoid lethal health issues, the Department of Biotechnology in collaboration with Amber Group of Clinics, organized a health camp in the university premises on 22nd April. Convening an approximate of 230 people, the event pulled together an outstanding response from students and staff members, who’ve showed a keen interest in their medical assessments. Intending to create awareness amidst the crowd about various health related issues that might prove fatal if not cured on time, the biotechnology department setup a series of medical tests during the day enabling attendees to take more precautionary methods required for proper healthcare. “Our health camp strongly holds the idea that prevention is better than cure. 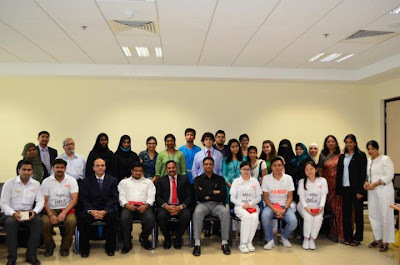 We are carrying out all basic tests like BMI, cholesterol, dental screening, just in order to create awareness amongst people, and to give them basic idea about their health conditions to prevent future health ailments.” said Ebin George, final year biotechnology student from Manipal University, Dubai who helped organize the event. In what emerged to be the most shocking of results, a majority of students suffered from obesity while most of the staff members had high cholesterol. Blood pressure levels were high amongst both students and staff members. Although on the bright side, results for dental hygiene and physiotherapy were considered normal. The campaign aimed at initiating an active response towards physical wellbeing and fitness. The event was a great success, thanks to the joint effort from the department of biotechnology and Amber clinics.